Rudy is looking for his jumper. He’s searched everywhere – indoors, outdoors, upstairs and down. In the kitchen, in the bathroom—round and round and round. Wherever can it be? A super-cute, super-fun book with flaps, die-cut pages, and a counting element too. 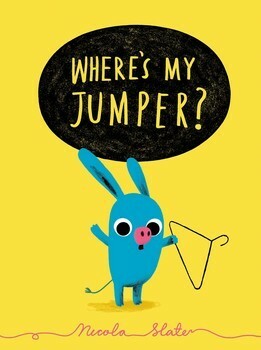 Bright, bold colours, peek-a – boo cut outs/flaps, cute animal illustrations and a theme that most young children can relate to – a favourite piece of clothing, this book makes for enjoyable reading. Add to this the opportunity to practice counting – “…TWO queuing crocs… TWO passing foxes…SEVEN ski –dogs” etc and you have a perfect gift that will give hours of enjoyment to the toddler in your life.